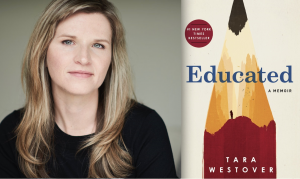 Tara Westover’s memoir, Educated, has been on the bestseller list for 48 weeks now. That’s almost a year. Educated is the story of a girl who was raised in Idaho, by a fanatic father who denied his family education and even medical attention, and how she was able to get away by attending Brigham Young and Cambridge University. Her’s is the rags to riches story that we all love. Humble beginnings and glorious endings. A ragamuffin to a scholar. But is there more to this memoir? Is Westover touching on something in our collective human condition? Perhaps. Afterall, who among us can say that we haven’t gone back, again and again, to our own dysfunctional relationships and tried, just one more time, to make things work? Is that pattern, which she writes about so agonizingly in her book, that so captures the reader? Or is it that she highlights, yet again, the violence against children who have no way to defend themselves and become, no matter how hard they strive to get away, disturbed and troubled adults whose only true freedom is distance from their once oppressors? Or is it, as Westover says in an interview with Mitzy Rapkin, on the podcast First Draft, that this book is about achieving selfhood, “via the materials we feed to our minds?” These questions and possibilities were discussed by the students in the various Studios, and below is an edit except from one of them. Listen and perhaps share your own perspective on Westover’s book. Why is it doing so well? What kept you reading to the end?